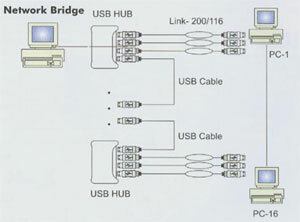 The PC-Link USB bridge system is your fast solution to peer-to-peer data transmission through the USB Ports between two computers of among sixteen computers to its full capacity. Not only this device transmits data at a much greater speed than the traditional parallel connection cable does, but also it completely support the plug and play function of windows 98/98SE/ME/2000/Mac operation systems for quick installation. 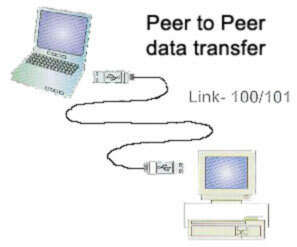 The PC-Link application program is designed in the standard format of the Windows program manager. This feature makes file transmission just one drop - and - drop operation. 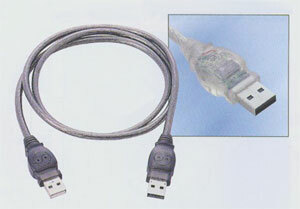 Full compliance with USB Specification Revision 1.1. PnP driver running on Win98/ME/2000/Mac. Bus power from either USB port. 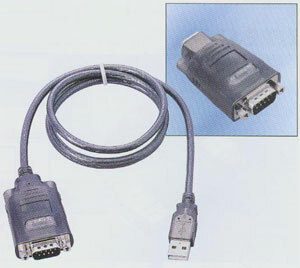 The USB to Serial adapter provides an external plug-and-play RS-232 serial connection with your computer, letting your free up yours existing serial port. Users have the capability to utilize the adapter with serial port interface in an easy to use environment. The adapter is designed for connection to cellular phones, PDAs, Digital Cameras, modems or ISDN terminal adapters through your USB port with up to 230 kbps data transfer rate. Works with cellular phones, PDA Digital cameras, Modems, and ISDN terminal adapters. Supports Windows 98/98SE/ME/2000, MAC8.6 and higher, Linux. Frees your RS-232 ports for other uses.